First I thought it was because I downloaded the last version of Valentina but an other file opened well. Can you help me or is the file lost? Can you help me or is the file lost? Your file is corrupted because the last increment has wrong name. 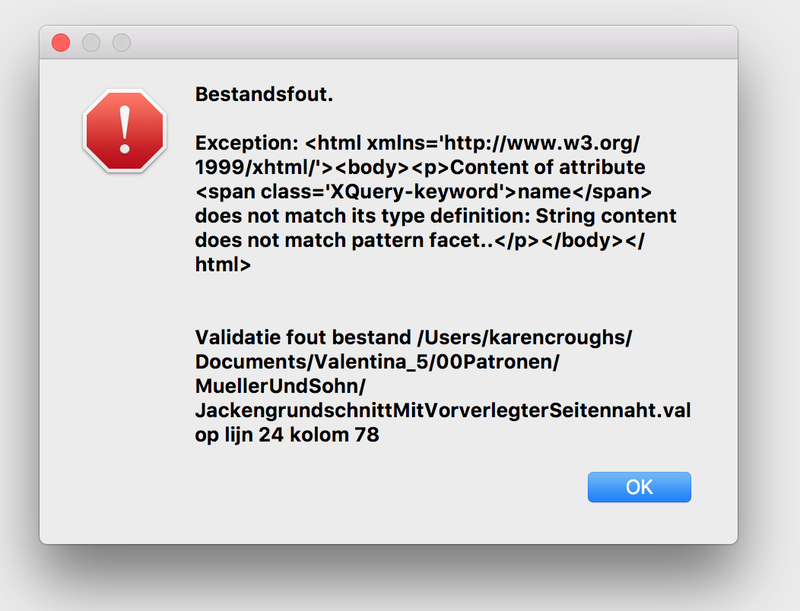 Fix it to <increment name="#Verkleinen" description="" formula="0"/> and you can continue your work. But i am wondering how to repeat this bug. Don’t have clue how you managed to write this name. Valentina should block invalid names. First; looks easy to fix but how do I get acces to tabel; I don’t know of an other way then to open the file first and that is not possible. Second; when you want to make a new record in the increment table and you push the + button, the field ’ increment name’ gives a standard “#Verkleinen/vergroten_1”. I probably wanted to make a new one and then decided not to and left it there. When the name gives problems, the standard name in the program should be changed I think. For now I must be alert to delete the record. First; looks easy to fix but how do I get acces to tabel; I don’t know of an other way then to open the file first and that is not possible. Sorry, i thought this is obvious. You can open the file with regular text editor (not Word), for example Notepad. And edit that line. Second; when you want to make a new record in the increment table and you push the + button, the field ’ increment name’ gives a standard “#Verkleinen/vergroten_1”. Thank you, this exactly what i was looking! Time to write a test.